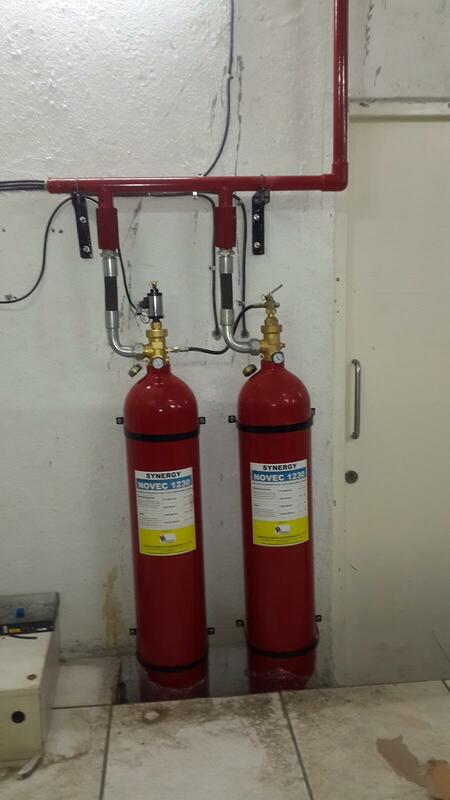 Delta team is expert in Automatic fire suppression systems, we are the leading fire suppression system suppliers in Bangalore. 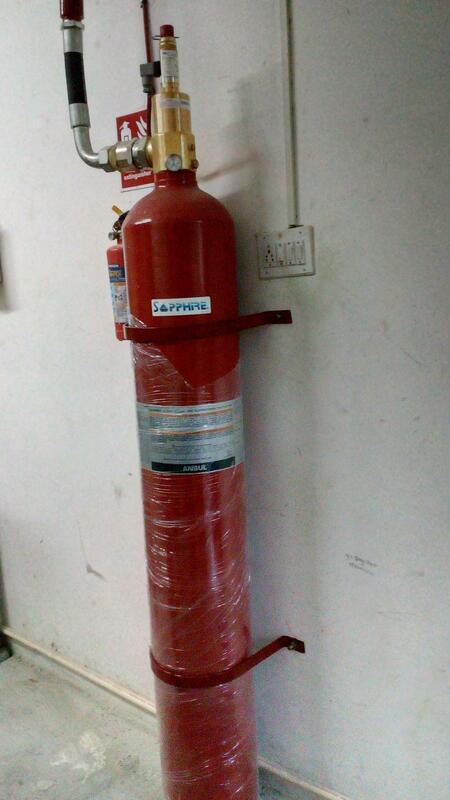 FM-200: The best people compatible, clean agent fire protection. FM200 (HFC 227ea) is known chemically as Heptafluoropropane and is manufactured by Great Lakes Chemical Corporation. 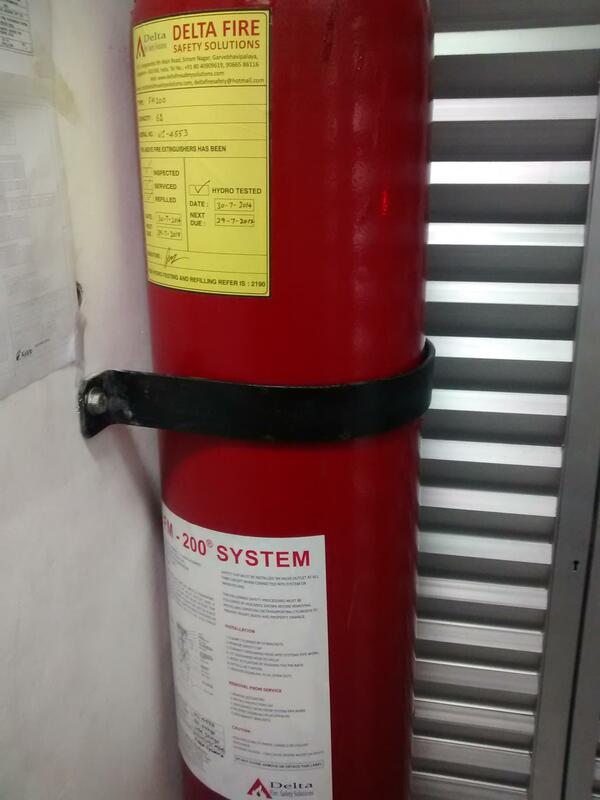 FM200 is a colourless gas which is liquified under pressure for storage. 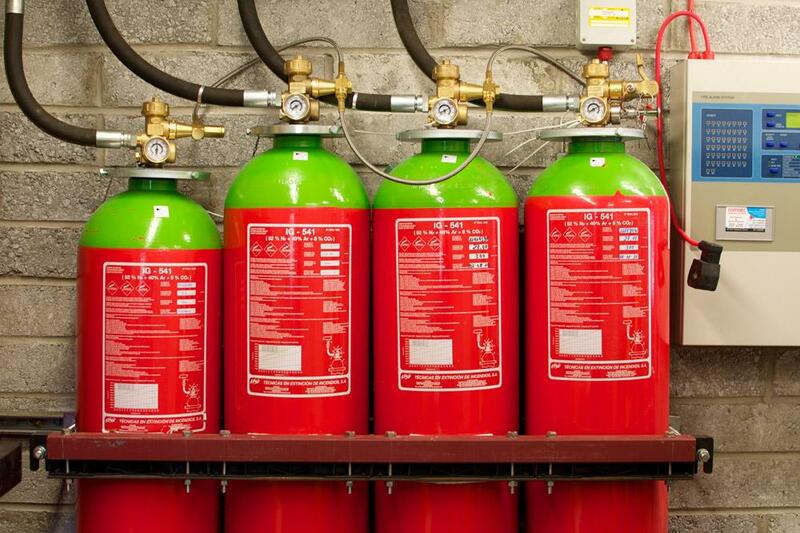 Like Halon 1301 it has a low toxicity level and is superpressurised with Nitrogen to 24.8bar (360psi). It rapidly extinguishes most commonly found fires through a combination of chemical and physical mechanisms. 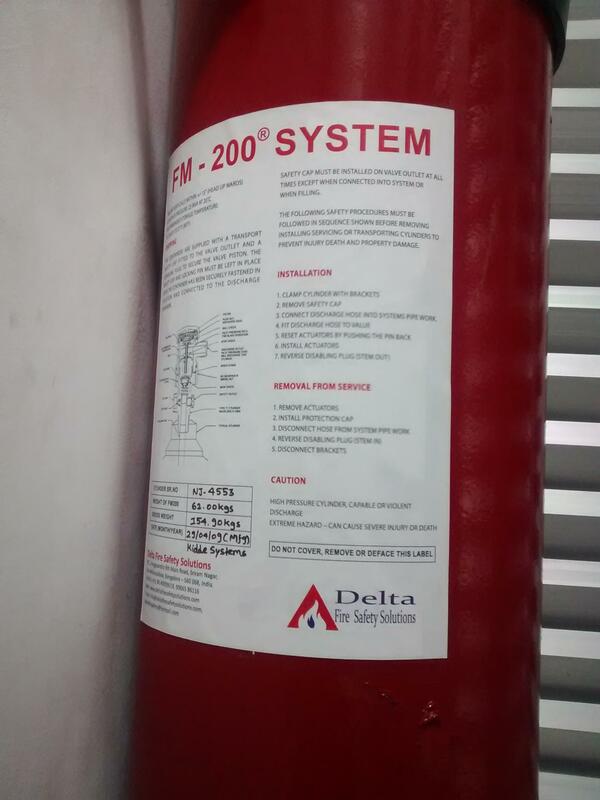 FM200 is immediately available to protect most hazards traditionally protected using Halon 1301. It is effective in the protection of data processing, telecommunications and electronic equipment as well as most flammable liquids and gases. Existing Halon and CO2 control systems meeting the requirements of the relevant national or international standards are ideally suited for use with FM200 and can be modified to operate as part of an FM200 system. Due to the differences in concentration and physical characteristics between the gases it will be necessary to change the container valve and nozzles and probably the pipework and storage containers in carrying out a retrofit of an existing system. However, due to the similarities in the equipment, changing from Halon or CO2 to FM200 can be accomplished with minimal disruption and little or no system downtime. CO2: A low cost, non-damaging, non-conductive, multi-hazard protectant. 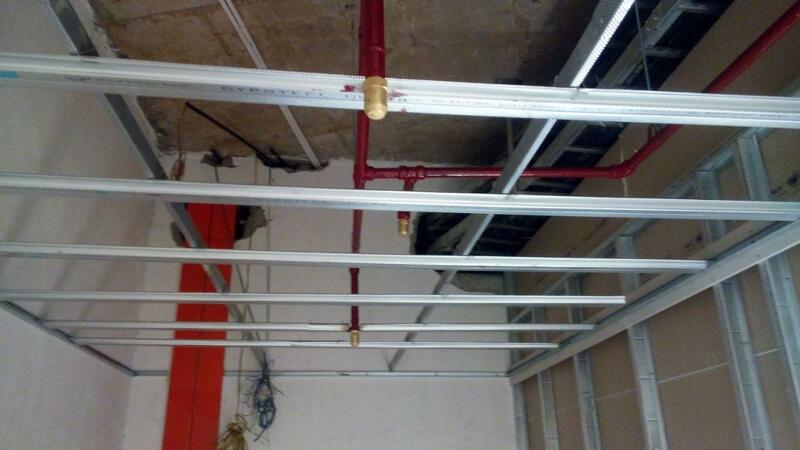 A depressurized network of pipes and open extinguishing nozzles covers all areas of the building that need protecting. 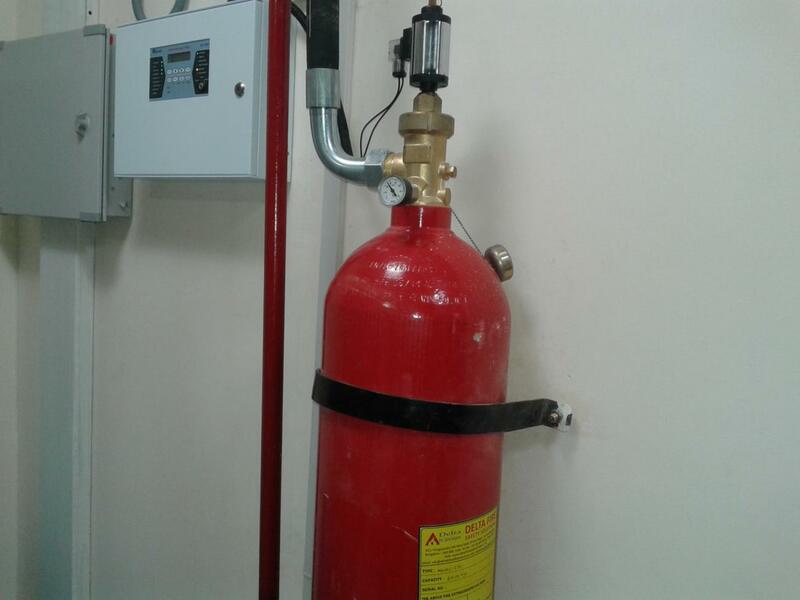 The extinguishing agent is conveyed through this network to the extinguishing cylinders under high pressure and is distributed evenly in the area to be protected. Prior to the agent being released, an alarm is activated so that the area can be evacuated. At the same time, doors and other openings can be closed and technical facilities operated as necessary. The activation of further local alarm systems sends a message to a unit that is permanently manned (normally the fire brigade). 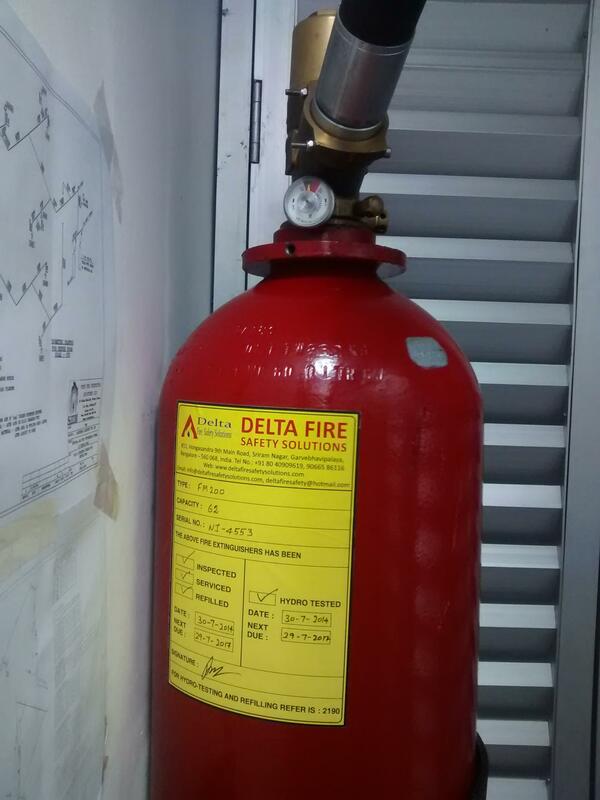 Risk of fire hazard proves to be very dangerous in the modern commercial kitchen. Fire in kitchen is generally due to burning of oil. However oil & fats burn at relatively high temperature and hence once they catch fire, extinguishing them is very difficult. Open flames, red hot cooking surfaces and a heavily grease- laden environment help the kitchen fire to spread quickly and have proven to be very difficult to extinguish. 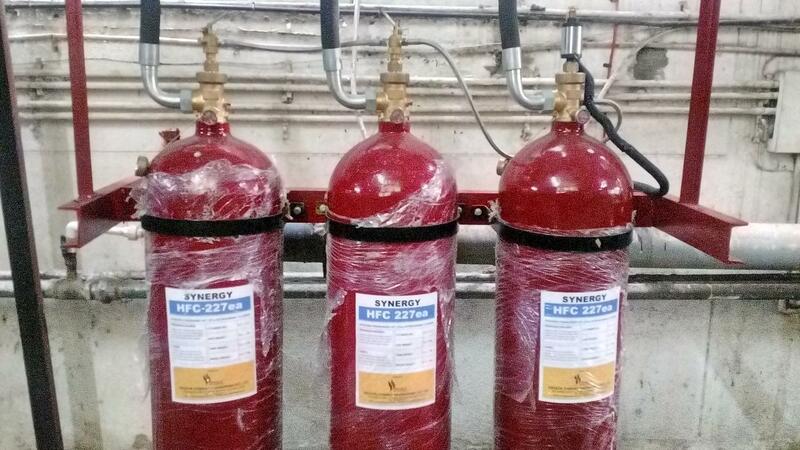 With the aim to protect modern kitchens from such risks we have developed SYNERGY KITCHEN FIRE SUPPRESSION SYSTEM. 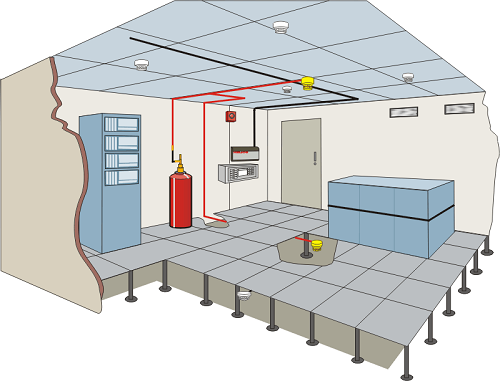 The system is developed according to the NFPA & UL Standards. It can be widely used in the Kitchens of the Hotels, Institutes, Restaurants, and Schools etc. 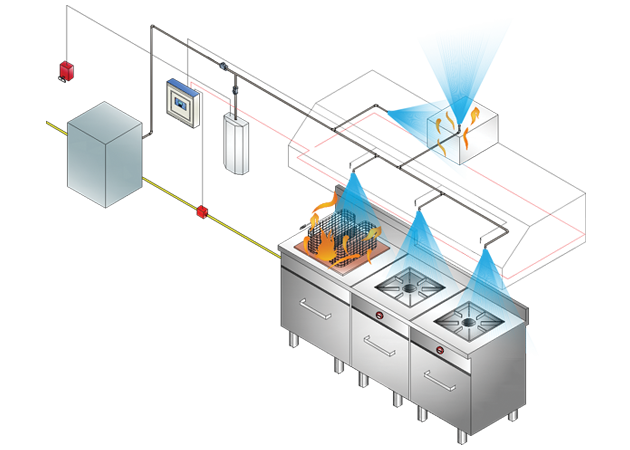 The Kitchen Fire Suppression System is designed to provide fire protection in hoods and ducts of cooking appliances for restaurants. The basic system consists of wet agent tank enclosed in a cylinder mounting box, Temperature Sensors, Heat sensing cable, Control panel, Nozzles, piping, & water storage tank (optional) etc. The system provides automatic actuation with an option of being actuated manually through a remote manual pull station. The system is also capable of shutting down other appliances on system actuation, if required. Additional equipments such as remote manual pull station, mechanical and electrical gas valves, pressure switches, electrical switches & accessories such as alarms, warning lights, etc. can be integrated with the system. As the fire is detected Control Panel activates the wet agent tank and wet agent is discharged extinguishing the fire. Single and Multi Wet Agent tank system is available. The SKFS System suppresses fire by spraying the SYNERGY Low pH Liquid Fire Suppressant on the plenum area, the filters, cooking surfaces, and the exhaust duct system with a predetermined flow rate. When the liquid agent is discharged onto a cooking appliance fire, it cools the grease surface, and reacts with the hot grease (saponification) forming a layer of soap-like foam on the surface of the fat. This layer acts as insulation between the hot grease and the atmosphere, thus helping to prevent the escape of combustible vapors. The system is designed as a hybrid (agent and water) system. Upon actuation, agent is discharged onto the hazard area. Immediately following discharge, the waterline system is activated and it allows water to flow onto the same hazard areas, continually refurbishing the foam blanket and cooling the hot appliance to prevent reignition. FM-200® and CO2 are two of the most effective forms of fire suppression, and in facilities from power plants to clean rooms, they will work when water is just not an option.